The Feral Cats online group has extensive experience working with scaredy cats and can give you ongoing support. We highly recommend joining if you’d like to learn more about scaredy cats and how to help them. 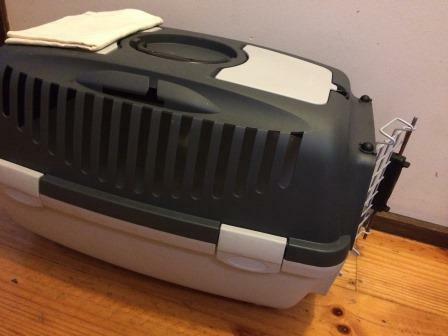 A carrier with a lid that unclips is ideal for scaredycats. 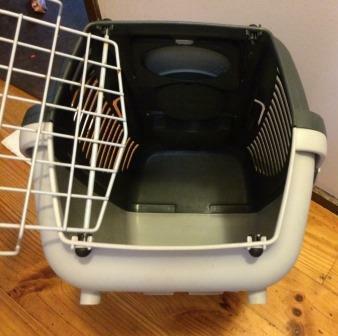 Instead of having to pull them out through the front of the carrier, you can gently lift off the lid to gain access. They may be able to stay in the carrier base for some of the examination. Just make sure all the clips are in good condition and securely fitted. When carrying the carrier, we recommend holding your hand under the base, or wrapping a ratchet strap or ocky strap around it. We love the Gulliver 2, made by Italian company Stefanplast. They are sturdy and easy to disinfect. They also have a flap at the top, through which you can put your hand to comfort them. The Reject Shop occasionally stocks these. Aldi also sometimes sells a similar model. The Gulliver 2 cat carrier has five quick-release catches and a hole at the top to put your hand through. Check out this video showing other good styles and how an easily removable lid enables them to stay in the bottom part. Few cats like leaving their homes. Even fewer like going to the vet. You can make things a little less traumatic for them. Calm their nerves by putting a few drops of Emergency Essence or Rescue Remedy on their fur. Calms Forte also works well. You can dissolve a pill in water then squirt the liquid into their mouth using a dropper or drip a few drops onto their fur. We buy Calms Forte, and many other cat supplements for balanced home-made raw food, from iherb.com. Spraying their carrier with Feliway before they are in it may also help. Feliway is available from vets but is much cheaper online. If you can pick them up, and if you’re using a front-loading carrier, pop the carrier on its end, so that the door faces the ceiling. Pick them up and gently lower them into the carrier, bottom first. They will be in before they know it. If they splay their back feet apart, gently hold them together until they’re in the carrier. 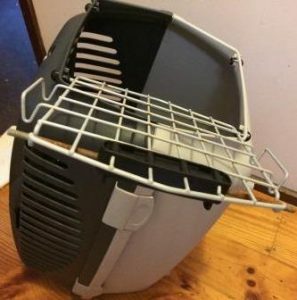 When you tip the carrier up, it will balance on its ‘back’. You can (relatively) easily lower a scaredycat into the carrier, back feet first. This is generally much easier than trying to put them in head-first with the carrier in its normal position. A flap at the top means that you can stroke them while driving, or when at the vet, before the examination and easily apply more Emergency Essence or Rescue Remedy to their fur. Planned visit If you can’t pick them up, and if this is a planned vet visit, start feeding them in the carrier a few days beforehand. When it’s visit time, gently close the door while they’re in it. 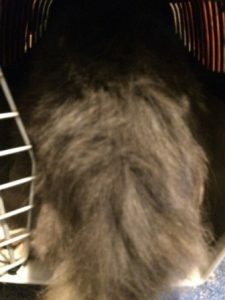 If they need to be fasted, use a tiny morsel of food on vet day and make a trail into the carrier. 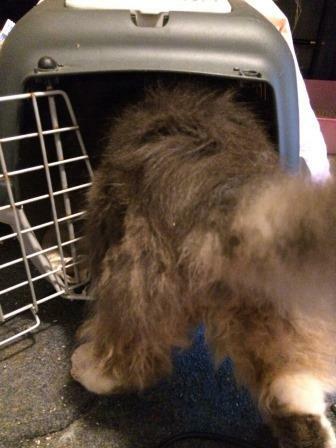 This kitty had his meals in the carrier a few days before a planned vet visit. On vet day, the carrier door was closed once he was fully inside it. gently and calmly stroking the back of their neck, gradually increasing pressure, then very quickly moving to a very firm scruff. Put them into the carrier bottom-first. Attempting rugby tackles or chasing them around a room rarely works well. They will be very stressed and more likely to defend themselves by biting or scratching. Once they’re in the carrier, cover it with a towel or sheet. This will reduce their stress. Before you open the carrier, triple check that all windows and doors are closed. 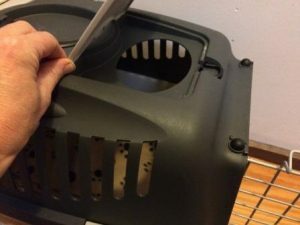 Vets who aren’t used to working with scaredycats may not have experienced the tiny spaces cats can get through, or how agile they can be when frightened. We have been to a number of clinics where the examination was about to begin, with doors open. If it won’t interfere with the examination, let Kitty stay in the carrier base. They will feel a little safer. Put the towel or blanket that’s in the carrier over their head so they feel less vulnerable. Watch very skilled and cat-savvy vet nurses manage a grumpy cat during an examination. Similar principles can be used for scaredycats. If you live in Melbourne, Australia, we may be able to provide a training session for groups of five or more. This would primarily suit rescue group foster carers. It may also be beneficial to workers at shelters that are interested in increasing their lifesaving rates by socialising cats. If you have gained basic skills in socialising timid cats, you may like to teach others. We are making available a PowerPoint presentation on the basics of socialising. By downloading the file, you agree to acknowledge www.scaredycats.com.au as the author and copyright owner.